To promote his new Half Empty/Half Full album Simon Todd played two rare band shows, this one in Tynemouth and the previous Friday at Newcastle’s Bar Loco. 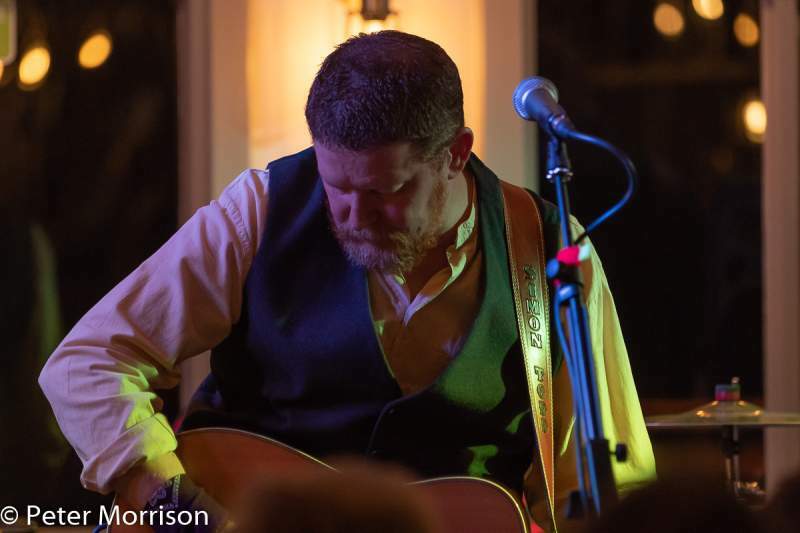 Formerly part of Morgan Le Fay, one of Tyneside’s premier bands of the 1990’s, Todd generally plays acoustic solo shows alongside other singer-songwriters. For this pair of gigs he’s drafted in his Central Station pals – Rachel Bailey on accordion, keyboards and violin, her bass-playing husband Michael, guitarist Mark Anderson plus drummer George Waters – and the quartet complement Simon’s carefully crafted words and music with style and finesse. Half Empty/Half Full was produced by Boo Hewerdine and Chris Pepper. Formerly of The Bible, Hewerdine was the writer of Eddi Reader’s major solo hit The Patience Of Angels. He’s also Todd’s songwriting mentor and suggested that the new album should have a theme. Simon’s songs are always about something and taking Hewerdine’s advice Half Empty/Half Full is, as he relates, a “look at situations from alternative, multiple or different perspectives”. Set one draws on older songs from Contracts For The Sale Of Land, Todd’s previous album with memorable numbers like Rhyme And Reason and In Control And In Your Care getting good reactions from the capacity audience. Simon has played extensively in the US and it’s fitting that set two kicks off with Down By The River, a slice of Americana that reads like the script of a western. Lines like “He pleaded for his life as I pushed in the knife” and “I never killed a man who didn’t have it coming” are pure Quentin Tarantino. Gory story it may be but the backing chants of “Hey ho, hey ha ho” from Michael Bailey and Mark Anderson still have the audience joining in along. Send Her Home To Me is a powerful love ballad with a twist where the narrator is asking his ex- girlfriend’s new bloke to “send her on home” when he’s “done with her”. The non PC sentiments of some of the lyrics make the listener ponder on whether the singer is actually advising himself rather than the former flame’s new boyfriend. Judas Kiss, unsurprisingly, is about betrayal, with Mark and Michael this time dishing out “oohs”. Todd has enough great songs to guarantee that the encore will be a corker. Going back to the Morgan days, Debutante/Keep The Homefires Burning’s string accompaniment from the super-versatile Rachel and an up-there falsetto vocal climax by Todd make this poignant piece of musical theatre the Christmas Number 1 that never was. A song and performance that would be difficult to follow and Simon and the band don’t try.